It’s not often that a business succeeds locally, let alone on a global scale. But for Carolyn Plummer of Bloomfield Hills, CEO of It’s a 10 Inc., the world came to her door. Since its inception in 2005, It’s a 10 has become one of the fastest growing hair product companies on the planet. The firm started with just one product, and since then, Plummer and Scott Scharg, co-founder and president, haven’t held back on expansion. It’s a 10 has several things going its way — all of the company’s offerings are made with natural ingredients, no animals are used in the testing phase, and the packaging is vibrant and bright. But perhaps its greatest advantage is that all of the products combine many attributes into one. 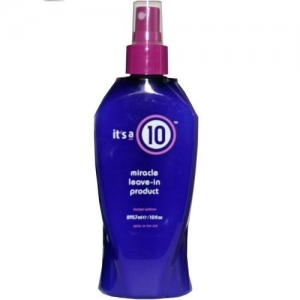 For example, It’s a 10’s Miracle Leave-In Conditioner is guaranteed to repair dry and damaged hair, add shine, smooth and control frizz, seal and protect color, detangle, stop hair breakage, create silkiness, enhance natural body, and prevent split ends. Another benefit of It’s a 10’s product line is that it appeals to large segments of the population. Those with “ethnic hair to fine hair can use the same product,” Plummer says, by way of example. Looking ahead, Plummer and Scharg are teaming up with actress Christina Applegate and her Right Action for Women Foundation to introduce a special edition of the Miracle Leave-In Conditioner in October, during Breast Cancer Awareness month. It’s a unique partnership. Applegate, on several occasions, has stated that It’s a 10 Miracle Leave-In Conditioner is “truly a miracle product.” Not one to let an opportunity slip by, Plummer reached out to Applegate and suggested It’s a 10 design a pink special edition bottle of Miracle Leave-in Conditioner, with the proceeds benefiting the actress’ foundation. The move was all the more compelling given that both Scharg and Applegate are cancer survivors. Plummer adds that Applegate is courageous for being so young and public about her cancer. “Christina is trying to make a difference and help others,” she says.